Black Widow: You've had the Infinity Gauntlet this whole time?! Nick Fury: An Infinity Gauntlet. There are at least two. Black Widow: Why don't you use it to wipe these guys out? Black Widow: Why even wear it if you aren't gonna use it? Nick Fury: Scientist Supreme hacked all my vaults. We're moving everything to Asgard, and Pym is reconfiguring the main vault, but in the meantime I can't risk anybody getting their hands on the Gauntlet. Nick Fury: Let them wait. Nick Fury: Hold my calls, and cancel my meetings, Potts. Pepper Potts: What are you planning? Nick Fury: That was the most fun I've had in years. Wasp: You're the worst at fun! Odin: Since you've chosen to bear the Infinity Gauntlet, you may as well master it. As we say in Asgard, "Don't pull a spear unless you're planning on plunging it into someone's spleen". Nick Fury: The more I use it, the more attention we're gonna get from you-know-who. Odin: The time for hiding has passed. You will need to be ready for war. Odin: Unleash Infinite Fury! And for the love of Odin, have a little bit of fun while you're at it. Nick Fury: What's the status on the drone updates, Stark? Iron Man: Should be ready to go. They'll respond to your eye-movements, and take you anywhere you wanna go. Nick Fury: I don't tell you this enough, but thank you, Stark. I was hard on you when you first got here because I didn't think you were taking it seriously, but I appreciate everything you've done for Avengers Academy. Iron Man: I think the Infinity Gauntlet is bringing out your softer side. Nick Fury: I think you're right. I usually yell at my coffee for being too hot, but this morning I just gave it a stern talking to. Black Widow: Nice flexibility. You could have a future in ballet. Nick Fury: I don't think the world is ready for this mean ballerino. 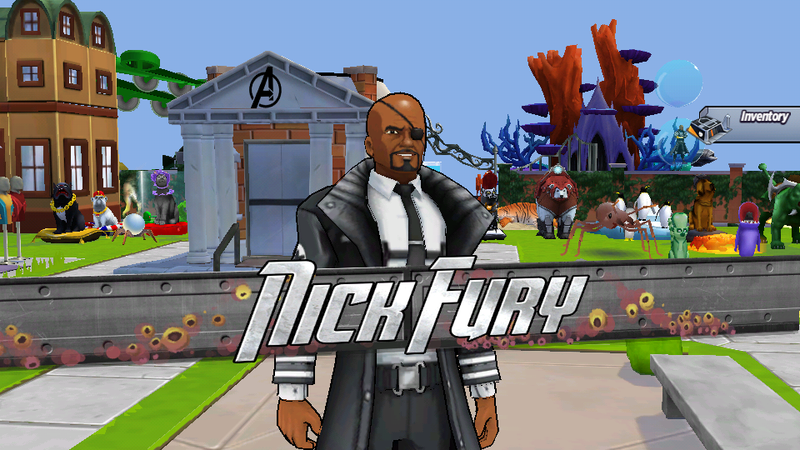 Nick Fury: Take over S.H.I.E.L.D. for a while, Coulson. I need to plan our next move. Phil Coulson: You want me to run all of S.H.I.E.L.D.?! Nick Fury: It pretty much runs itself. Phil Coulson: Don't you think Agent Carter is more qualified? 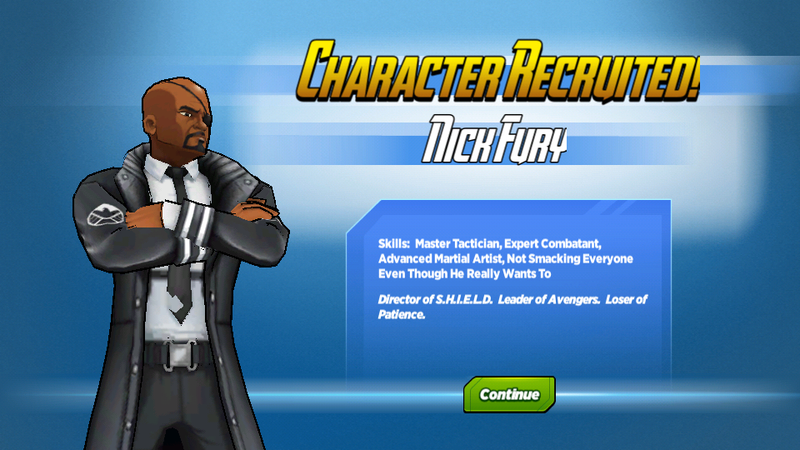 Nick Fury: Yes. She was busy. Nick Fury: I know you can do it, Coulson. You've done it before. Phil Coulson: We're having trouble securing the vaults Scientist Supreme hacked. 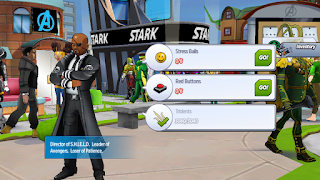 Nick Fury: Build new doors. Weld them shut, and bury them in cement if you have to. It's not that complicated. Phil Coulson: I know it shouldn't be, but even Hercules couldn't get 'em to budge. Our techs try to use their tools, and they fly right out of their hands. Nick Fury: Use a different material. Phil Coulson: For both the doors and the tools? What's better than solid Vibranium? Nick Fury: Anything that isn't metal. Nick Fury: I need you to guard my vaults. Hulk: Hulk has dinner reservations. Nick Fury: This is more important. Nick Fury: Do this for me, and I'll have my guys buy you every slice of bacon in the tri-state area. Hulk: Chocolate too. Chocolate go good with bacon. Nick Fury: Everything goes good with bacon. Nick Fury: Did you get the profile I downloaded? Ultron: Yes. I'm hesitant to start following orders after my little revolution, but this person is clearly a threat to robotkind. Nick Fury: This is reconnaissance, Ultron. Not an assassination. Ultron: You really are the worst at fun. Nick Fury: We need to put a call out to all of our friends in hiding. Pepper Potts: You just asked me to hold your calls, and cancel your meetings. Nick Fury: Change of plans. We can't close the vaults. Nick Fury: Hulk, Hercules, and half the Asgardians are standing guard. If whatever is coming gets through them and the Infinity Gauntlet, we'll improvise. Nick Fury: Spy talk for try not to die. Pepper Potts: The secret seven say they're willing to reveal themselves if there's no other option, but they're dealing with similar issues at the moment. Pepper Potts: I don't know. I usually just yell "Science!" and he comes running. Nick Fury: Nice thinking, Potts. You're gonna make a great Director someday. Hank Pym: Director Fury! I heard you yell "Science!" so I came running! Nick Fury: I need you to scan every known alternate universe for strange activity. Hank Pym: I'd think you were making a joke, but it would be unprecedented! Nick Fury: I realize everything about them is strange. I'm mostly interested in evidence of anyone travelling in or out. Hank Pym: You think an alternate got here without us knowing?! Nick Fury: Wouldn't be the first time. Hank Pym: I caught a Kang sighting and countless stranger things in the multiversal scan, but nothing to indicate that an alternate travelled here without our knowledge. Nick Fury: This is why I don't like making new friends. They come with new enemies. Nick Fury: I need you to deliver a message to the Attilan Academy. Nick Fury: They don't trust me. Ms. Marvel: Why do you think they'll trust me? Nick Fury: It's a long story. Ask anybody there but the king. Ms. Marvel: THAT. WAS. AWESOME! Nick Fury: Did you deliver the message? Ms. Marvel: I got teleported by a giant wrinkly antennae dog! Nick Fury: What did they say? Ms. Marvel: Nothing! It was really hard for him to talk, so we just played teleportation catch! Nick Fury: Not the dog, Kamala. The royal family. Ms. Marvel: Right. Sorry. The queen said they'll do whatever's necessary, but not until the other school reveals itself first. Her hair was amaaaaaaaaazing. Nick Fury: I have to fix this before it's too late. Can you get me back to before the timefog? Hank Pym: We've been over this. What you...what happened irrevocably changed all realities and the spacetime continuum. Even the distant past reflects our current reality! Nick Fury: So you're saying you can't do it? Nick Fury: So do it. Hank Pym: You could be permanently lost in the timestream. You could die. Nick Fury: That's science, #%@&*%$#. Hank Pym: How did you find your way back? Hank Pym: He saved you?! Hank Pym: You saw him?! What do you think of Nick Fury? Were you able to recruit him? Any favourite phrases or actions if so?